Olivera’s Repair, Towing, and Express Lube is a full service automotive repair shop serving the Santa Ynez Valley communities of Buellton, Solvang, Santa Ynez, Los Olivos, Ballard, and Los Alamos; as well as commuters and travelers in need of auto repair and maintenance services. Started in Buellton, California in 1949 by Bill Olivera and George King, Olivera’s was originally located behind Pea Soup Anderson’s as the O.K. Garage. Mr. King later left the company and the building was (literally!) moved up the street to our current location at 611 Avenue of Flags, and is now still functioning as the center three bays of our six-bay repair shop. With the addition of a parts store (now Buellton Auto Parts – Carquest) and a Richfield Service Station (now housing Olivera’s Express Lube), Bill completed his automotive dynasty with becoming a AAA towing roadside assistance provider. In 1999, Emmet Hickey joined Bill as a partner in Olivera’s Repair, Inc. Upon Bill’s retirement in 2003, Emmet became the new President, CEO, and head honcho of Olivera’s. 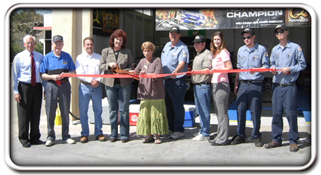 In February 2007 we were honored to open Olivera’s Express Lube, the only Santa Ynez Valley quick oil change facility. We hope that on every one of your visits with us you will find our commitment to quality repair work and outstanding customer service. We know that you have a multitude of choices for automotive repair and we are pleased to do business with you. For more details on our services offered, please visit our Services and Express Lube pages.